If The Shoe Hurts, There May Be A Remedy Foot pain affects more than a third of American adults — particularly women. And conditions that exacerbate it can worsen with age. But ending foot pain can be as easy as buying different shoes or wearing plastic inserts called orthotics. Robin Powers, 53, hauls a bag of shoes into her appointment with podiatrist Emily Cook at Boston's Beth Israel Deaconess Medical Center. Powers, who works in the fashion industry, has been suffering from foot pain. Robin Bentz puts an orthotic into a shoe. "It's been like a miracle," says Bentz, whose foot pain stems from plantar fasciitis. "My feet never touch the ground unless I have my orthotics." "Probably in the past five years, I've noticed a real shift in my foot," she says. "It's narrow in the back and wide in the front, and my arches are falling." She suspects it has something to do with the bunions she inherited from her mother -- and the high heels and strappy sandals she wore as a young adult. This isn't Powers' first visit with Cook, but today Powers says her goal is to figure out which of her shoes to wear to minimize the pain. Cook says Powers' dilemma is pretty typical. In fact, foot pain is a major problem that affects nearly a third of all U.S. adults. "Talk to 10 friends, and many will likely tell you, 'Yes, I have foot pain,' " says Marian Hannan, an epidemiologist at Boston's Hebrew SeniorLife and a professor at Harvard Medical School. Unfortunately, it's often not viewed as a serious problem, she says. "You don't generally die from it. It's not cancer, and it's not really been given the serious attention" it warrants. To understand how many Americans suffer foot pain, Hannan led a National Institutes of Health-sponsored study of 3,300 adults. She wanted to know how many experienced foot pain, if women had more pain than men, and if pain interfered with activities like walking and exercising. She found that roughly 28 percent of the population had chronic foot pain. Women experienced nearly twice as much foot pain as men. And for many people, the pain was so bad, they could hardly walk -- let alone exercise. Many people figure foot pain is just another problematic part of aging, and they'll just have to live with it and get used to the pain. Hannan says nothing could be further from the truth. If you have foot pain, she says, go see someone who specializes in feet. That would be either a podiatrist or a physical therapist with foot expertise. The pain can often be treated successfully and further problems prevented. Stiff Shoes: Shoes should be stable, but flexibility is also key. They should bend in the spot where the toes bend. Shoes That Don't Fit Properly: Shoes that are too big or too small can pinch or strain feet. As you age, your feet may grow wider and longer, and your shoe size may change, so measure your feet regularly. High Heels: If you have to wear high heels, try varying the shoe and the heel height during the week. Same Shoes Every Day: Alternating shoes on different days can help keep feet limber. Foot pain in Hannan's study most commonly came from bunions, but people also had hammertoes, corns, calluses, flat feet and a very painful condition called plantar fasciitis. All of these conditions get worse with age, Hannan says. The problem is also exacerbated by the obvious: Shoes -- heels, pointy and narrow -- that just don't fit. Men tend to buy ill-fitting shoes that are too big, which can present support problems. But for women, the problems are more varied. Toes squished into pointy shoes. Foot bones crunched into shoes that are too narrow. And feet smooshed into shoes that are just too small. Heels, of course, put added pressure on the ball of the foot, and if the ball of the foot is squished into a pointy toe box, the problem is even worse. And, unfortunately as we age, our feet can feel the brunt. "Our feet can actually get wider, and they can change shape," says Emily Cook, the podiatrist. "They can change size. You can lose flexibility within your joints. Certain foot deformities -- bunions, hammertoes" -- can worsen over time. Weakened ligaments and joints, arthritis and a thinning of the fatty pads on the bottom of our feet can also cause complications. And men aren't exactly off the hook. The same things happen to the aging male foot. But because of the shoes women tend to wear, foot problems are far more common among women. Cook says there can be remedies. Many problems, she says, can be diminished by simply buying more appropriate shoes. And she offers a number of suggestions: First off, shoes should fit properly. It's best to buy shoes at the end of the day, as feet can swell as the day wears on. Also, get your feet measured routinely. Aging feet can get wider and longer. You may no longer be that size 6 at age 55. You should be able to wiggle your toes in the shoe. They should not be crunched. 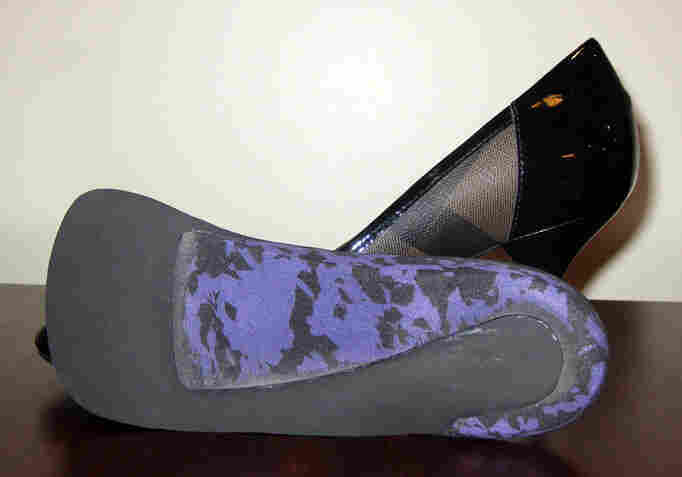 The heel should offer support and shouldn't collapse when you squeeze the heel-box portion of the shoe. If shoes don't feel comfortable right away, don't buy them. And don't be fooled by the you-just-have-to-break-them-in argument. There's no such thing as a break-in period. If you feel you have to wear dressy shoes or heels for work, try wearing different pairs on different days. "What I tell women in this particular situation is that you need to think of different types of shoes for different types of purposes," Cook says. "For example, when you're traveling, you don't want to wear a dressy type of shoe. You need something like a sneaker, something very supportive that's comfortable so you're not beating up your foot before you even make it to the event." 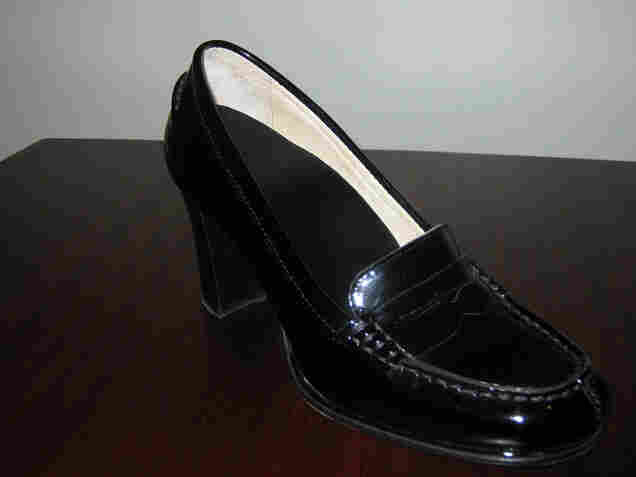 Cook also encourages patients to minimize the amount of pressure placed on their foot by wearing lower heels. "If you must wear heels, try to change the heel height and use different-size heels on different days," she says. Cook appreciates women's need to appear stylish on the job, adding that it's frustrating for women in particular because the shoe industry is driven by fashion -- not comfort and fit. For some patients, new, more comfortable shoes may not be adequate enough to relieve and even treat foot pain. They may need orthotics, which are plastic inserts that fit directly into the shoe for cushioning and support. Some over-the-counter products are fine. Cook says patients often try these less expensive options first. The Cobra (far left) is for heel heights greater than 2 inches. It fits in most women's shoes but isn't as supportive as other orthotics. The Graphite Dress (second from left) is lightweight but bulkier than the Cobra, and only works with shoes with less than a 2-inch heel, including men's shoes. More supportive than the Cobra is the Holethotic (second from right) for heels 2 inches or less. 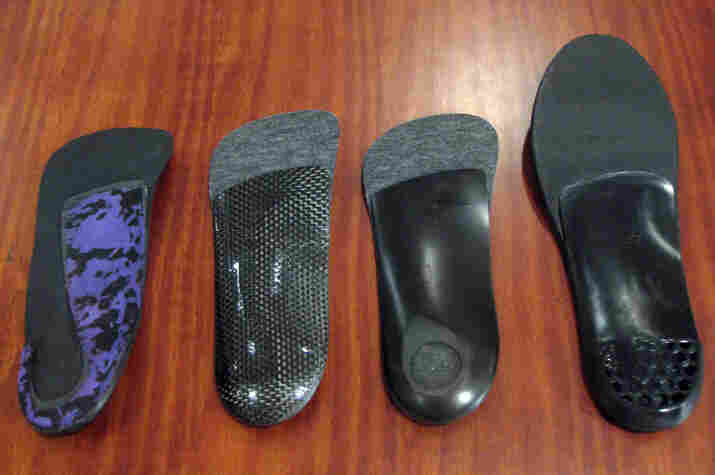 The prefabricated orthotic (right) is not customized like the other three, but fits in athletic shoes and men's shoes. Shoes should bend at the base of the big toe, where we carry most of our body weight when we walk, says Cook. Shoe soles should be stiff, like this one, for optimal support, Cook says. When shoes twist easily, our muscles compensate, making for tired and sore feet. Test shoe stiffness by gripping each end of the shoe and making a twisting motion, like wringing out a towel. 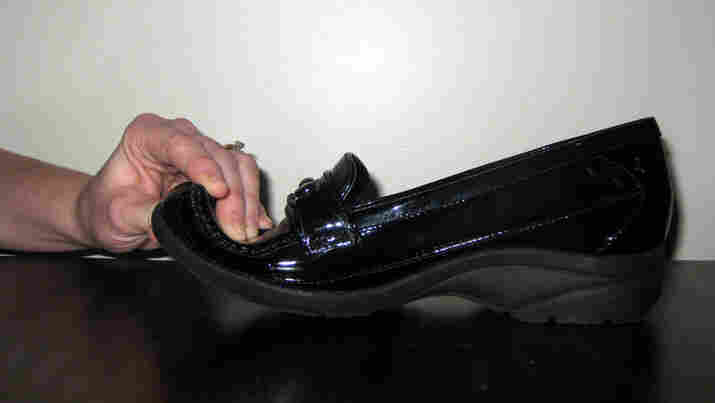 The shoe heel stabilizes the heel bone. If the heel collapses easily between your index finger and thumb, then it won't withstand the force of your weight when you walk. An orthotic device should be small enough to fit in shoes comfortably while providing adequate support. 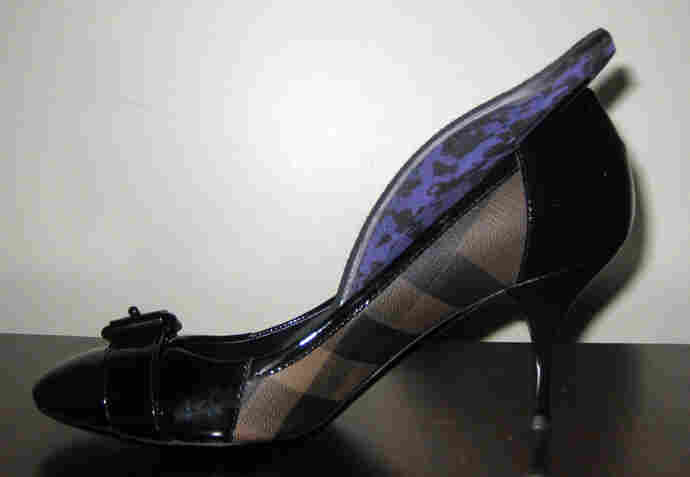 The Cobra orthotic in a high-heeled, narrow, women's shoe. The Cobra orthotic fully seated inside another shoe. Some foot doctors think custom orthotics are too expensive, especially since they are typically not covered by health insurance. But for particularly complex problems, Cook says custom orthotics may be exactly what's needed. For 62-year-old Robin Bentz, just putting her foot on the ground and standing up had become excruciating. Early on, she thought the pain would just go away. It didn't. As a retired nurse, Bentz suspected plantar fasciitis. She was right. "It got so bad that I would get up in the middle of the night and go to the bathroom, and my feet would ache so badly by the time I went to the bathroom and came back to bed," Bentz says. "The pain would just literally keep me awake for the rest of the night." Bentz tried to adjust how she walked to compensate for the pain. But then, her knees started to hurt. She went to an orthopedic surgeon and had cortisone injections, but the pain continued. Finally, she went to see Cook. After an examination, Cook suggested custom-made orthotics. Bentz has two pairs of orthotics that she alternates. "It's been like a miracle," Bentz says. "My feet never touch the ground unless I have my orthotics." Bentz says she was astounded that something so simple would cure such a huge problem, and she's forever grateful. But things don't always work out this way. Cook says some patients eventually require surgery, particularly for bunions. But often surgery can be put off for years with good shoes -- and, possibly, orthotics.